Saute onions for about 4 minutes olive oil. Add in cumin, oregano, chili powder, garlic, and beans. Continue cooking for another 3 minutes while stirring frequently. Add in salsa and cook for 1 minute. Remove from heat. Add cream cheese and 1/4 cup cheddar cheese. Stir until cheeses are melted. Warm tortillas according to the package. Microwave is ok. Spread 1/4 cup enchilada sauce in the bottom of a 8x8-inch baking dish coated with cooking spray. Fill tortillas with bean mixture; roll up and arrange seam down in dish. 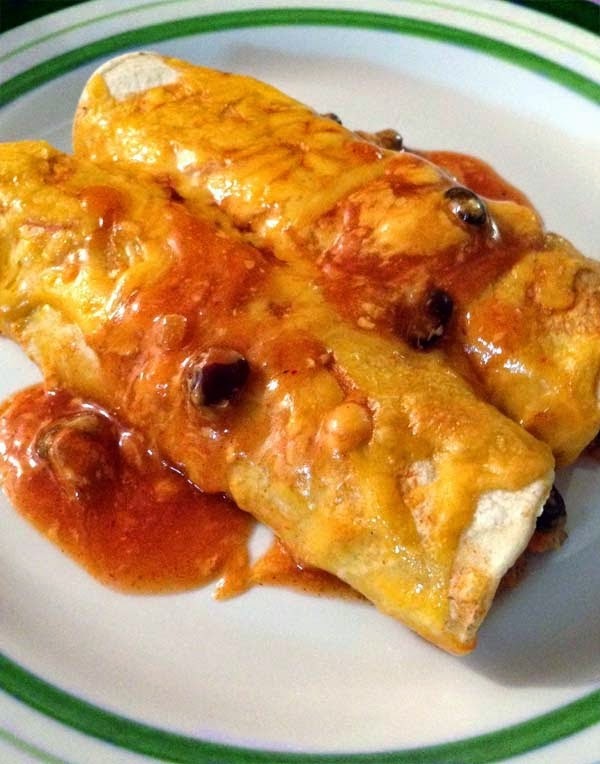 Pour remaining sauce over enchiladas and sprinkle with remaining Cheddar cheese. Bake in oven for 20 minutes. You can also make your own enchilada sauce. Here's a tasty looking one from Pinterest.